When the holidays roll around I’m usually in a frenzy looking for new recipes. I like to switch it up each and keep the menu fresh. I also like to surprise my family with a special breakfast. On Christmas, we have the traditional Pepperpot and bread for me and my son while my husband has ackee and saltfish. As though that wasn’t enough food, I usually add a few more items. Having breakfast together is one way to connect with each other as you start the day. A special holiday breakfast doesn’t have to mean a long and tiresome meal; after all you’re not trying to waste precious time slaving over a stove but spend time with your loved ones. 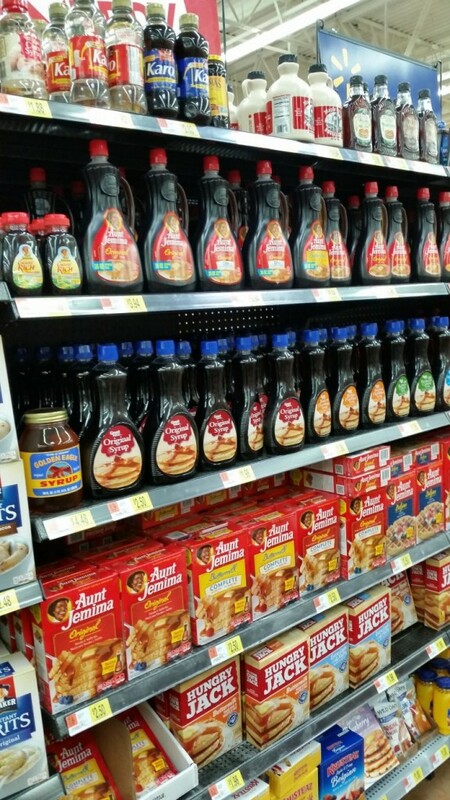 Aunt Jemima has a variety of pancake mixes and pancake syrups that are available at Walmart that can make your holiday breakfast effortless. 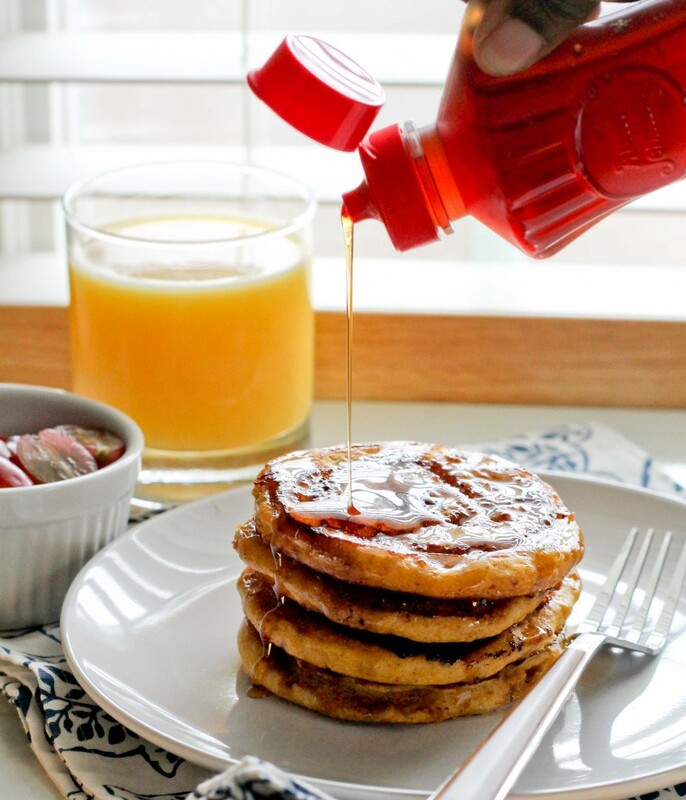 I used the Aunt Jemima Original Complete Mix to create these amazing Cinnamon Swirl Pumpkin Pancake which would be perfect for any holiday breakfast. The mix is pretty easy to whip up and you can easily add your favorite things like crushed bananas, chocolate chips, berries or whatever you like. To kick things up a notch I added buttermilk, melted butter, pure canned pumpkin filling and pumpkin spice to the mix; I then swirled the batter with a buttery, cinnamon and brown sugar mix to create cinnamon bun effect. It was amazing and it didn’t take a whole lot of effort. These did not last long! I served it with Aunt Jemina Original Pancake Syrup and fresh fruit. To make the cinnamon swirl, mix all ingredients together in a bowl then add to a squeeze bottle or ziplock. If you’re using a Ziploc bag, cut a small hole on one corner. I found that a squeeze bottle worked best as it allowed me to shake it in between uses when the butter and sugar separated. 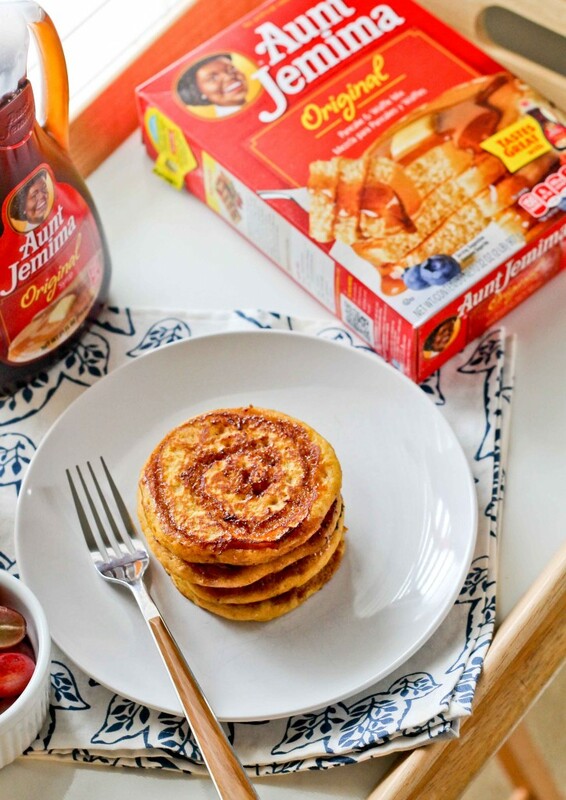 To make the batter, mix Aunt Jemima complete mix, buttermilk, melted butter, egg, pumpkin spice and pure canned pumpkin until it comes together. Don’t over mix. The batter will thicken as it sits. Place a large nonstick pan over low heat and add butter. When butter is melted, use a small scoop or ¼ cup measuring cup to add the pancake mix to the pan. Use the back of the measuring pan or spoon to spread the mix to form a circle. 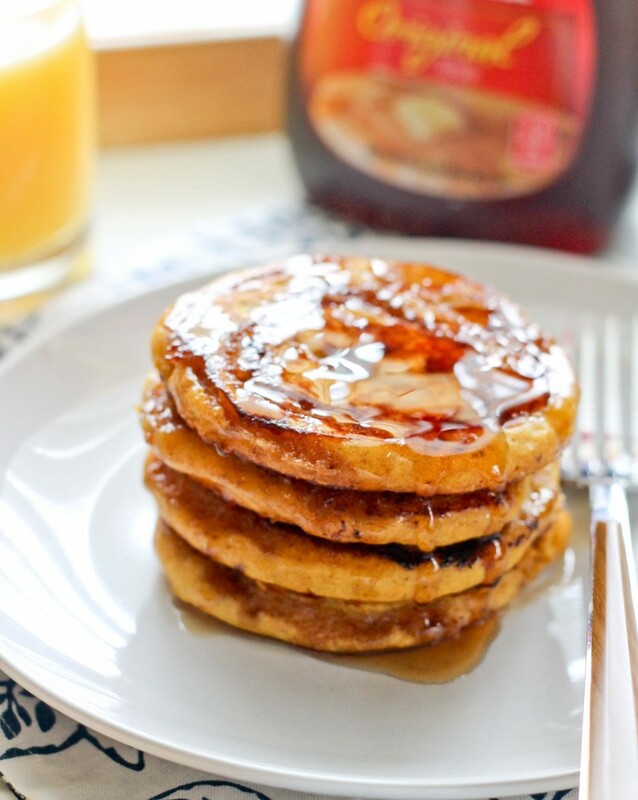 Make a swirl on the top of the pancake starting from the center and making your way out. When the pancake starts to form tiny bubbles on the top, flip the pancakes. Cook until the pancake is done and springs to touch. Repeat until the batter is used up. 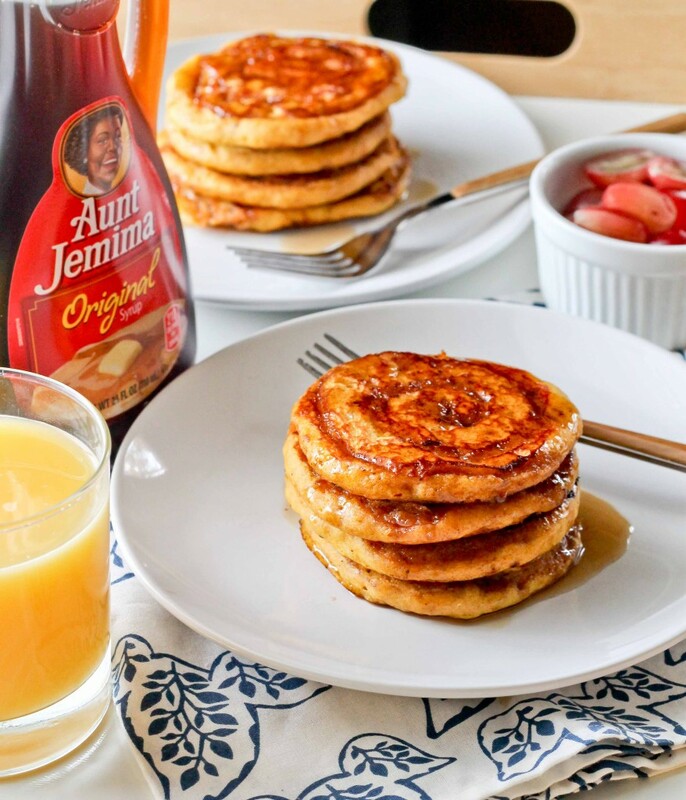 Serve with Aunt Jemima Original Syrup.